Old Spice is running a video contest, inviting members of the public to make an Old Spice Swagger advertisement for a chance at $10,000. “Would you and your loved ones like free money to spend indiscriminately on precious stones, helicopters made entirely of diamonds and nuclear-powered toothbrushes? 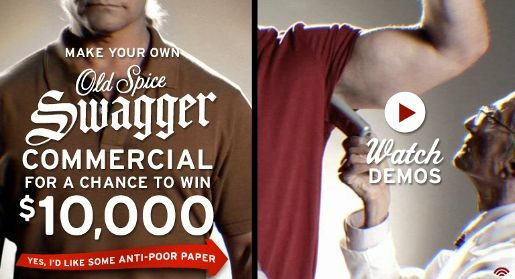 Create and submit an Old Spice Swagger commercial that highlights the amazing power of Old Spice Swagger for a chance to win 10 grand. Demo videos and details are available at OldSpice.com. The Swagger contest was developed at Wieden+Kennedy, Portland, by executive creative directors Mark Fitzloff and Susan Hoffman, creative directors Jason Bagley and Eric Baldwin, copywriter Jason Bagley, art director Eric Baldwin, agency executive producer Ben Grylewicz, agency producers Sarah Shapiro and Lara Gallagher. Filming was shot by Rosey via @radical.media, Los Angeles, with executive producer Donna Portaro, line producer Alexandra Lisee and director of photography Marten Tedin. Editor was Jon Hopp at Rock Paper Scissors with executive producer Linda Carlson and producer Vicki Tripp. VFX were produced at A52 by Flame artist Andy McKenna with producer Peter King. Sound was mixed at Lime Studios.